Alberta issued a special flag to commemorate its centenary year. A firm called Flagworks has apparently won the contract to produce these flags. 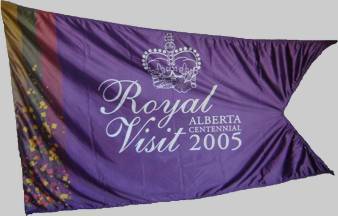 The flag pictured here was displayed at Commonwealth Stadium in Edmonton for the arrival of the Queen on May 23, 2005 to officially launch celebrations of the centennial year of Alberta's entry into Canadian confederation. Limited quantities are available through the manufacturer, the look company.